Did you know that a 7 seconds video start-up time can result in 50 percent of your audience giving up on playing the video? According to Akamai’s report, the most important factor for streaming services success is, in fact, start-up time, which is the gap between when the viewer hits play and when the video starts. 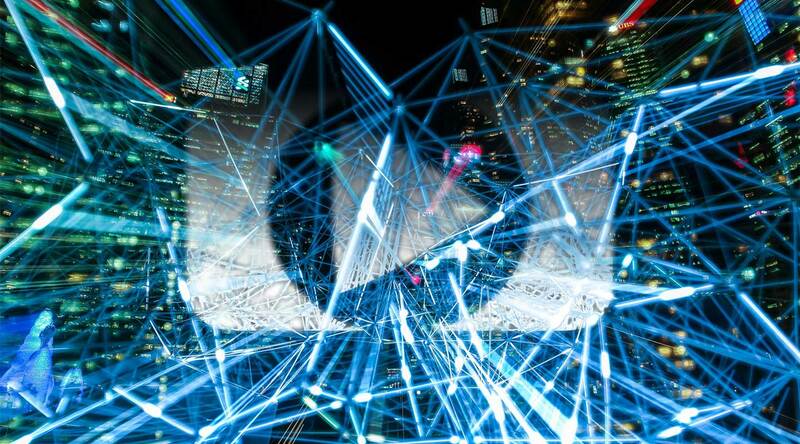 Akamai is one of the world's largest Content Delivery Networks (CDN) and what CDNs do is helping your content to reach your users on time, no matter where they are geographically based, without you having to set-up your own servers. The delivery of the content needs to be fast and secure, but sometimes content delivery patterns are not consistent enough, which may cause some loss of data. In order to always deliver the seamless video experience to your global audience, THEOplayer has come up with a solution: the THEOplayer Network API (watch it here). People are streaming more videos than ever and, in parallel to the rise in demand, their expectations towards the video quality increase: low latency, no buffering and, above all, a smooth video experience. There will always be unexpected surges in traffic while serving your content to an end-user and this is where multi-CDN come into the picture: they will, in fact, share the load across multiple CDNs, which means that the cached content can be easily retrieved from the closest server near the end user. Multi-CDN allows load balancing between multiple servers, which means equally distributing traffic among CDNs. In a case where one of the deployed servers fail to deliver your content, a different close-by CDN will do the job, delivering the content smoothly to the customer. This is the reason why multi-CDN is often the best option for emerging video streaming companies. How does THEOplayer Network API work? Normally, a video player makes a number of requests when trying to play video content. This kind of information is generally not accessible from the outside, however, our THEOplayer Network API is able to guarantee access to our network handling. This allows full visibility of the network activities in real time, which is helpful to measure and handle network information. The network requests performed by the player at specific time intervals, together with its responses, can be easily acquired, which becomes the key to determine the best CDN. 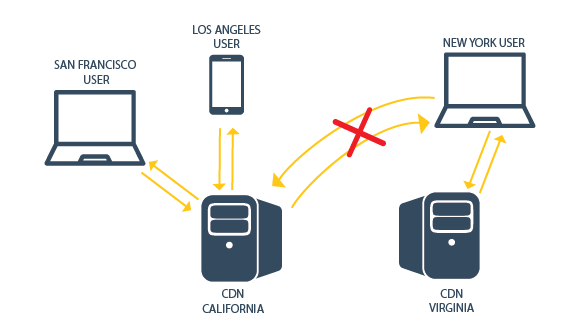 If there are two CDN providers that can serve your content, one located in Virginia and the other one located in California, you want to be able to know the closest and optimal one that can deliver a smoother playback. The speed of the CDN could be calculated based on the response time which can tell us a lot about the network behavior. In this case, if you know that most of your users are in Washington DC and the CDN in Virginia has cached your content, our Request Interceptors will allow to determine which of the CDNs can deliver a smoother playback with very low latency and no round trips to the origin server and back. This also drastically reduces the video delivery costs: since the content is cached, the CDN doesn’t need to make requests to the origin server. Available bandwidth, throughput and network latency are just some of the characteristics that can be retrieved by THEOplayer’s Network API. With this information, it becomes easy to decide if redirecting your user’s request to another reliable source on a different CDN is beneficial. Sometimes, CDNs happen to fail during playback: the CDN that is currently serving your content might suddenly experience peak traffic and the performance and stability start to decrease, leading to a poor quality video experience and lag. In this case, THEOplayer's network API helps to redirect the user's request to another optimal CDN: the nearer the CDN is to the users, the smaller the RTT (Round Trip Time) is between the users and servers, leading to faster availability and reduced buffer times. Cost cutting is always the key to a growing business. Choosing the best CDN can reduce both bandwidth consumption and your video delivery costs, letting the users have the highest quality experience. You don’t need dedicated engineers or heavily priced software or plugins to know when to switch between CDNs: THEOplayer Network API helps with making the switch easier, optimizing your costs for content delivery. Do you want to learn more about how to reduce your costs with THEOplayer Network API? Contact us to talk to our video streaming experts or simply click the button below. Topics: reduce buffering, online streaming, new features, delivering content, "network api"